Pay now only a deposit of 150 Eur (and the rest the first day of the course) using the coupon DEP-150/380EUR before paying on the cart page. If you are repeating this course you can get 40% off this price using the coupon code AU40A before paying on the cart page. Note about arrival and departure: We recommend arriving at least 30 minutes before beginning of the class in order to complete your registration and familiarize yourself with the facility. The daily class schedule will be communicated on the first day of class (indicatively every day from 09:00h to 18:30h, with a lunch break). - Logbook, manuals of previous courses, notebook and pen. 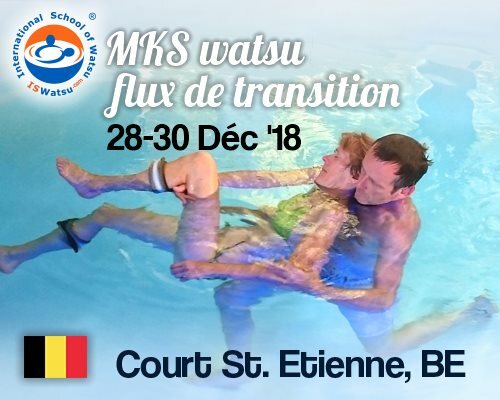 In the second section of Watsu 1 (the Transition Flow) you learn to connect these basic moves and positions with long gracefully flowing transitions. You learn to adapt this flow to people of all sizes, shapes and dispositions. You learn about your own body mechanics - how to support and move each person as effortlessly as possible in the water. On land you will explore what being held means to you and others. Students coming from afar or not willing to commute can stay overnight in the classroom, with access to the kitchenette (with kettle, fridge and sink, but without stove!) and provision of a comfortable mattress and pillow. Bring sleeping bag or duvet and pillowcase. The participation fee is 10 Euro per night. Bring some food to share. Tea, herb tea, spring water and snacks offered. Registration will be accepted on a first come - first serve basis. The registrations will be valid only upon receipt of a deposit of 150 €, and completion of the Registration Form duly filled with all requested personal data. The balance must be paid on the first day of the course in cash please. We won't be able to accept credit cards or cheques. INCLUDED IN THE COURSE TUITION Professional, highly effective -yet fun- instructors' teaching during course hours. Learning materials (course manual and video). Fee to use of all class related facilities. Certificate of participation issued by the International School of Watsu. TO PAY SEPARATELY Travel expenses, food and lodging costs (see details in the 'ACCOMMODATION' section). c) Cancellations requested via email between 6 and 4 full weeks before the beginning of the class will receive back their deposit less 100 € as administration fee and penalty for late cancellation. Early Bird Discount: a 30 € discount on the full tuition fee will be applied to the first 3 applicants. Students repeating the class will take advantage of a 40% reduction on the tuition fee, either the full tuition or the early bird tuition as appropriate.